Click here for a guide to fish in Big Walnut Creek. Bluegills and large-mouth bass are abundant in the Quarry Pond. Bluegills are in the sunfish family Centrarchidae and the order Perciformes. Bluegills live in shallow waters of lakes and ponds. 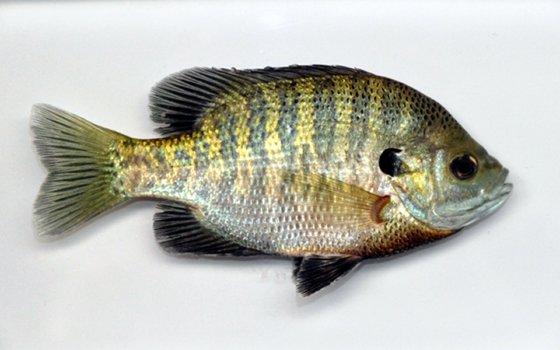 During the nesting season, a male bluegill scoops out a spawning bed in gravel or sand in shallow water. The nest is about the size of a dinner plate . The males are territorial and chase other male fish away from their nests. A female bluegill will lay her eggs in a male's nest. The male fertilizes the eggs, chases the female out of the nest, and guards the eggs. Large-mouth bass are also in the sunfish family, Cetrarchidae and the order Perciformes. The large-mouth bass has an olive green back and sides and a white belly. Large-mouth bass are a popular sport fish. The fish often leap out of the water to try to eject a fisherman's hook.